A colorful, delicious, no-fuss dish. 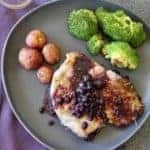 Baked Blueberry Pork Chops. A restaurant-quality meal at home! Heat oven to 425°F. Spread blueberries in 9×13-inch baking pan. Trim visible fat from the pork chops and lay on top of berries. In a bowl, stir together maple syrup, Dijon mustard, lemon juice, horseradish, rosemary, lemon zest, salt and pepper. Pour over pork chops. Bake 20-25 minutes, until internal temperature is 145°F. Lay broccoli and potatoes on a baking sheet, drizzle with olive oil and stir to coat vegetables. Bake 20-25 minutes, stirring once. The sauce can accommodate up to 6 pork chops.